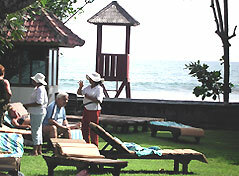 Established in 1976 Dhyana Pura Beach Resort was initially dedicated for a place to retreat body and soul as this 3,8 hectares property was the only reason people come to the area of Seminyak which, at time was still a hidden paradise. Hence the street was named Jalan Dhyana Pura. first 90 rooms were built to accommodate as contemplation place along with its two-story hall for group meditation. site for a family get together or a company outing, for we could easily turn these grass area into a team building place or a party place. 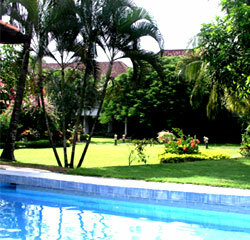 The hotel maintains 116 guest rooms which are spacious and well furnished. 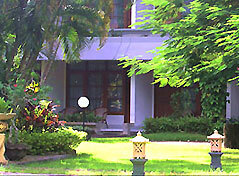 Each guest room has a balcony with a view to the lush tropical gardens. The hotel has two building blocks with 2 floors and one area consist of 17 cottages, all designed to reflect traditional Balinese architecture. 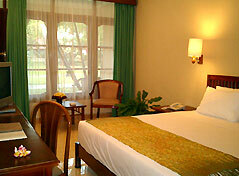 All rooms have an individual controlled air-condition, color TV, telephone, minibar, writing desk. 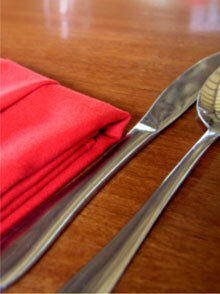 24 hour room service and same day laundry & dry cleaning service are available. Dhyana Pura Beach Resort has two main restaurants: Eden Garden restaurant for in house guests and Kintamani restaurant for conferences. 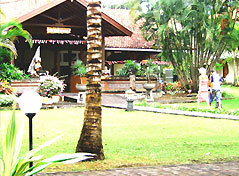 Dinner arrangement in our beautiful garden is mostly accompanied by Balinese dance on the open stage. On request we organize parties and get togethers on the roof of our building, with spectacular view of Kuta Beach sunset. The Eden Garden restaurant is set in the beautiful tropical garden of Dhyana Pura Beach Resort, next to our spacious swimming pool and located only a few steps from the beach. 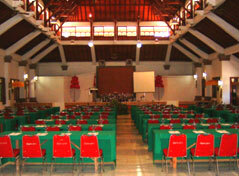 Kintamani restaurant is situated within wonderful tropical garden and is mostly used for conference or meeting groups up to 200 persons and special occasions such as wedding ceremonies and welcome- farewell dinners.